” Dr Foley would do well to do a little research and read comments made by councillors themselves before he makes public statements about the reason why councillors – after considering both sides of the argument – voted against fluoride in the water,” Cr Strelow said. “His ill-informed reactionary comments are an example of the type of behaviour which has contributed to this issue being such an emotive one within the broader community. 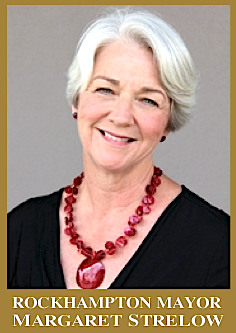 Merilyn Haines is absolutely correct when she says that most Australian doctors know very little about the adverse health effects of fluoride. I have skeletal fluorosis, and am fluoride sensitive, with many symptoms. For years I tried to find a doctor who could help me, but they couldn’t help. Eventually I figured out for myself that the problem was fluoride, mainly from fluoridated water. By that stage I had such severe joint problems that I could barely do the most basic things required to look after myself, and I am not old. Eight years later, most of my symptoms have disappeared or greatly improved, but even though there has been great improvement with my joints my activity is still severely restricted. Skeletal fluorosis can be permanent if it progresses too far. 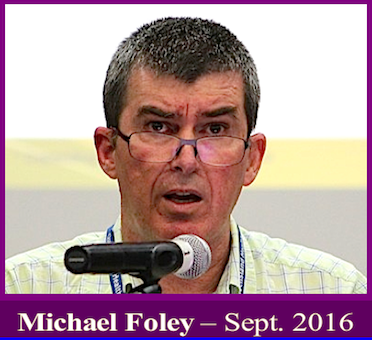 Michael Foley is a shameless hypocrite and liar, who should be in jail. If he wants to see poor quality research, he need only look at that which he and his fellow fluoridationists rely on. If anyone wants more information, they could start with the Fluoride Action Network website, Declan Waugh’s work, the journal Fluoride, and the 2006 US National Research Council report on fluoride in drinking water. There are also some good Australian websites. If in doubt leave it out! Good on you Merylin Hines, I’m with you 100%. I was always made to believe that cavaties where caused by sugary foods? Let’s ban companys like Coca cola from destroying our communities teeth? But typical of todays model of medicine we deny food and nutrition and run around looking for the next magical elixer to market and sell. I don’t want chemicals added to my water thankyou, yet I am denied this simple human right as long as I live in a flurodated region. The Australian Constitution is there to limit the powers the re-representatives (not nannies) excise over we the people. We’ve never at Referendum approved of this industrial waste mass medication. I’m a big boy now and my children know how to use a tooth brush. Take that waste product out of the municipal drinking water until such a time as we the people in the majority ask for it via Referendum. 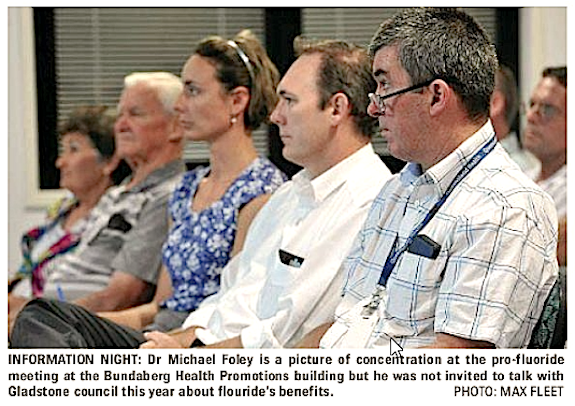 Dr Michael Foley again went quiet when the issue of daily fluoride dosage came up. Thing is, the whole topic should be mute as Dr Michael Foley is not my doctor. ABC, when did it become legal for governments and dentists to force dosages on Australians? Permission has never been given thus why the medical indemnity protection is in place to protect those like Dr Michael Foley. Why do they need protection from something they say is safe? Doctors used to indorse smoking as well. Dr Michael Foley, you are not my doctor. Dr Michael Foley, you are not my nanny. 95% of world agree with me. I don’t want fluoride in my water – that should be enough! Why should I have it when I don’t want it and don’t need it – or is Queensland Health the new unelected dictatorship of Queensland? No I do not want fluoride in the water…natural water full of healthy minerals, flows constantly beneath the ground, for us all to drink. However, if we keep polluting the natural water, via coal seam gas and chemicals, then heaven help us….but then again, maybe it is already helping us, with all the floods that Queensland has recently experienced….maybe these floods are flushing out these toxic chemicals from our water supplies. I guess we humans had better get over and on with the fact, that nature overides nurture, every time, regards. AS for litigation one needs to look back at Germany and damage done 100 rears ago. Approximately 17 million litres of poison water is released into the environment annually. This run off also effects the Great Barrier Reef via rivers. 100% water is fluoridated ..
40% lost in leaks before you get it. the 1/8 left that comes in to your house you drink less than 1% of it. things with but you are not drinking it..
children with a so called tooth problems it is about 3% of the population. in the first place ???. - “industrial waste”: table salt is always table salt no matter if it’s from a salt lake or urea. - “600 mg of lead”: that is 0.6% of the fluoride mix. When diluted down to 1 part per million, this lead is 6 parts per billion! - pointing to these trace chemicals is in itself misleading, when the argument is about fluoride. - She focuses on the results of adult tooth decay in children (teeth without much time to have developed tooth decay) as opposed to baby teeth. 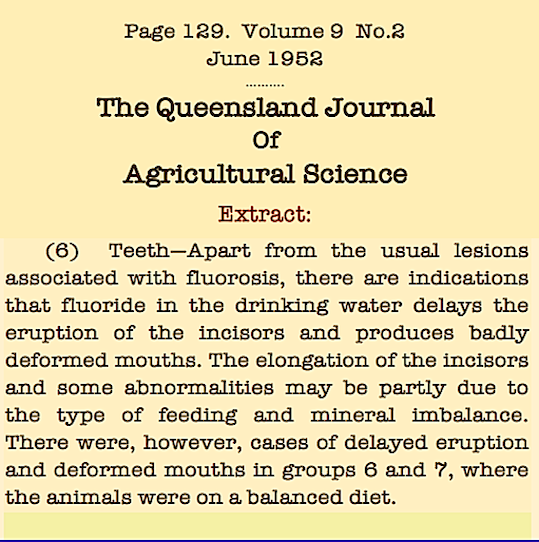 - She misrepresents the 2007 NSW Dental Health Survey, which concluded far less fluorosis and a noted difference in tooth decay between fluoridated and non-fluoridated regions. - She doesn’t name the study, but previously when she talks about osteosarcoma, she has been referring to Bassin et al (2006). The researchers behind this study couldn’t replicate the appearance of osteosarcoma and stressed caution in drawing the relationship. Dr Foley did a great job, but it made no difference to her position regardless how often he corrected her. I’ve been following this fluoridation matter for a few months now and I am amazing by how they interact with the science. For instance the 2007 NSW survey or the Bassin paper; neither support their position and yet, even when this is brought to their attention, they continue to use them as though the papers do. Wow this is a great debate from ABC regarding Fluoride in drinking water. It provides views from both sides of the argument and clearly highlights the major difference, one side is based on ideology, the other on research and facts. If you have any doubts or questions regarding the Fluoride debate, take the time and listen. Marilyn Haines, made very valid points. Take fluoride out of the water supply. The best way is to prevent tooth decay is to apply it directly to the teeth. Michael Foley tried to discredit her but what he did not say that no amount of water will save baby teeth from the affect of dinking sugar laden juice etc. and being too young to clean their teeth before they go to sleep. Fluorosis is caused by an intake of too much fluoride over a period of time, from a various of sources including tap water. Duhh?? Great debate Merilyn Haines… Too bad I couldn’t listen to it all, it was cut and inaccessible just after you mentioned your sister.. Shame. Dr Michael Foley is just another classic example of why we, as a Nation, are in such a poor state of Health ..
Foley is yet another blind, myopic, ignorant and myopic ego bound “professional” who as a dentist would use DISTILLED WATER to clean his dental equipment (search [ autoclave ]. In hearing this recording, now many times, I personally can see at least 20 mistakes that Foley makes. He would not debate me as he would lose. I would really like to see a record of where Dr. Foley has received his income over time, if or not he has accepted directly or indirectly any payments, inducements or ‘favors’ in any form from any associated with the HUGE fluoride proponents. This is simple: Do not fluoridate drinking water – let people decide. This arrogance of nanny state forced medication is a simple debate. ” Iodine is a halogen. fluoride will displace the other halogen and take its place”. is to fly in the face of science. not to partake of fluoride is to be forever damned. Dr. Foley is the local disciple who bullies us all. potentials 100 to 20,000 times that of carbon dioxide. a few plants synthesize organofluorine poisons that deter herbivores. A suicide bomber can only damage/kill a limited number of people once. 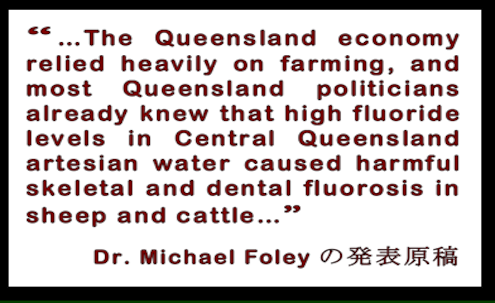 Michael Foley’s fluoridation damage is ongoing to millions of Queenslanders. (IADR) of which you are a member!